Earlier this year I had a visit from two students, Sean Terry and Richard Anderson, who are attending Sunderland University. As part of their final year thesis they were producing a radio documentary on F1 and came over to my house to interview me and get words direct from the horse's mouth - so to speak! Great production and includes interviews with a host of people in F1 across the years. Interesting approach that they took looking not just at the rigours of F1 but the effect on personal and family life. You can hear it by clicking below and go to their SoundCloud page by clicking on the link below the image. Thanks to Maureen at Insight Group Marketing for arranging and coordinating the interview and to Sean and Richard for coming along and including me in their radio documentary - good luck with your final year exams! "...the ever-determined Alastair Caldwell, navigated by his formidable 96-year-old mother, Dorothy." The following evening, saw Mother with 60ft long dugout canoe 400 years old Racing canoe and waiting for a coconut to drop! Not too much pressure at this time. There were lots of sugar cane trucks on the side of the road, waiting to sell their loads. They tried to get us to buy - they figured that Rolls Royce drivers must be able to buy the odd load of sugar cane, not really essential fodder for a rally. Mother is also fantastic and coping with everything, alert, interested and doing great at the navigation. Other rallyists are suggesting that she should be in the Guinness book of records as the oldest rally nav! Will try to keep updates coming but Internet tends to be very poor so far everywhere. 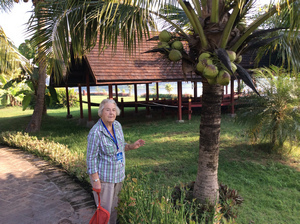 We are staying two nights in a hotel on Inle lake. It is just fantastic, lovely hotel and lovely long boats that whisk you through wonderful scenes that are from a travel brochure but they are real. The Burmese are just so nice and sweet it is almost too much, they have great reverence for age so treat Mother with great respect and tender care. Just a marvelous rally so far - bit off the leadership pace, but plenty of time to go yet and as The Telegraph said 'ever-determined'!! It is so good to be back in Argentina for the Cape Horn Rally in November. Brought back some great memories and we created a few more! As always I wanted to win and cross the line to see the chequered flag but sadly just pipped into 2nd place by Paul and Sandra Merryweather in their 1974 - Mercedes 450 SL - well done to them after a hard fought drive. I was joined by Laurel Smith in my 1968 Mercedes 280SL Sports, gleaming red under the beautiful Argentinian sky at the start line. That look didn't last long however as no sooner had we started than the head gasket blew! But I'll come back to that in a minute. Before the rally started we arrived into Buenos Aires in good time so had a couple of days looking round and doing a few visits to old haunts from my days coming here with McLaren in the 70s. The Grand Prix in '74 win was a memorable one for me as we won after local hero Carlos Reutman led the race and Juan Peron, the President of Argentina at that time, flew his helicopter to the track late in the race to view this triumph. The army used tear gas and gunfire to control the crowd and then Reutman's car failed and Peron left swiftly as Hulme won the race. It wasn't a friendly end to the race and and we had to be guarded from the crowd. Anyway, after reliving some of those great memories the rally, as I said, got off to a very bad start when the cylinder head gasket failed on the very first test! So we finished the day in a cloud of steam but actually leading the rally. With the help of the rally mechanics I changed the gasket that evening and the car ran very well after that - although it proved very hard to start when hot which is an old problem. The next two days were very good. The second day test was cancelled and we won both tests on the third day so finished off after three days still leading and still smiling. 17th November saw us crossing the desert - what a scorcher it was! Sadly Laurel's navigation duties were suspended as she went down with a tummy bug from the day before. So combined with car action, stress and heat she had a horrid day. The following day we had a rest day in Mendoza so a chance to recover for all of us. The following few days saw a lot of activity with Paul & Sandra just 8 seconds behind us, a Chevy, a few dinks here and there and some clouds of steam from cars in our rear view mirror. There's never a dull moment on these rallies! The last week of the rally went relatively smoothly driving through and visiting some great places with some majestic sites. Glorious weather and a great drive over the Andes from Mendoza to Santiago - great drive over the Andes up to 11000 feet and down again with such beautiful views. When we arrived in Santiago, Chile after the day's test, we had a second day as a rest day and ended up sitting by the fantastic pool of the Grand Hyatt Hotel. At this stage all was still going well on the rally, car running well and still leading - but Paul & Sandra closing the gap. 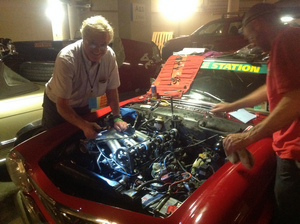 I spent a lot of time as we travelled trying to locate another head gasket to replace the one I used on the first day - not tempting fate just like to make sure we had one in reserve in case the rally took its toll again. Sunday 24th was a rest day in Bariloche, Argentina and still all going well and the car still leading the rally - just! We stayed in a fantastic hotel - Resort LLAO LLAO - which they tell us is the leading hotel in the World. I can believe it. Perched on top of a hill surrounded by lakes and snowy mountains. It was probably the best place to discover that we were no longer leading the rally, my good friends Paul & Sandra finally overtook us, which is fine with me. Christian Dumolin and Regine Dumolin-Petillion third behind us. Felt really happy for Sandra as not only did they win it was also her birthday so a double celebration for them. Great drive, great rally, some marvellous sites, great racing and good times with some great friends in wonderful hotels en route. Can't wait until the next rally!! It’s still hot - but in more ways than one! Ferrari Air-Con modifications Mark II capitalising on the slip streaming from Ferrari and Space Station logos. The Dolomites - glorious views and glorious weather. Ferrari looking cool. So at the beginning of this post I mentioned that it was hot in more ways than one. Well there we were minding our own business with the latest regularity when right out of nowhere we were attacked by a.... concrete post! At the time we just couldn't stop because of the regularity so we pushed on and then came back to revisit the 'scene of the crime' and snap a few shots. Not as bad as it looks but bad nonetheless. Not sure if the Ferrari or the post came off worst! Hateful looks from the Ferrari as it eyes the 'downed' post! By the time you read this we'll be on our last day - wish us luck! 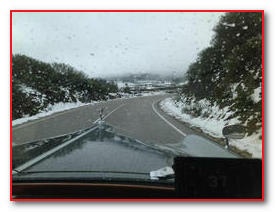 Just a couple of weeks after the London to Lisbon rally I was on the road again at the Paris to Madrid Vintage car rally. This time with the lovely Alfa adorned as usual with my lucky elephant Space Station sticker. 4th place in class and 13th overall in the London to Lisbon rally was good based on all the mechanical problems we had - but I hate not winning (!) so I was determined to do better on this rally. I thought everything was going to come undone before we'd even started when we discovered a water leak the night before. 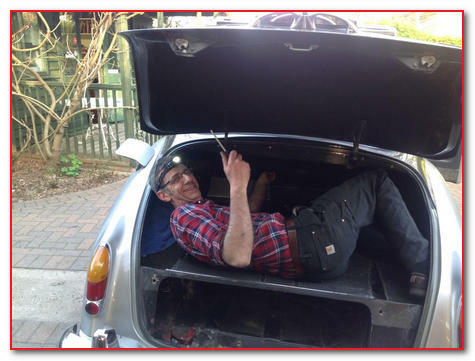 So radiator out of the Alfa and into the repair shop overnight and fixed - but it wasn't done until late in the morning! So a late push to the starting line in Paris. Fortunately for once we had planned to arrive a day early so we had time in hand and arrived in Versailles with plenty to spare and ready for dinner. We even managed a bit of tourist activity walking the Palace Gardens of Versaille which are really beautiful especially at this time of year. Great trees and old statues and some brilliant bronzes all on a theme of full size trees. Well worth a visit and free to enter! The 52 pre-war cars were flagged away to start the rally from Versailles to commemorate the incredible 1903 Paris-Madrid race - 110 years to the day. Our rally started well but we had poor brakes to start with, but a bit more fiddling saw them feeling and working better and we finished the day in the lead. A good omen for the days ahead. The field was full of some fantastic cars that had entered this year's rally. Some really interesting early vintage classic ones. 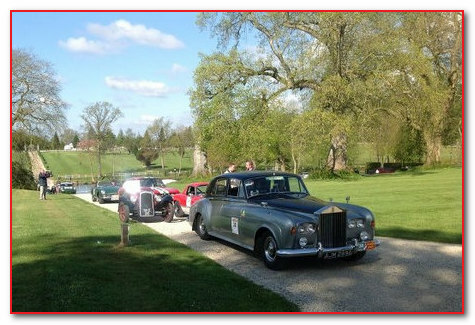 The rally follows the original 1903 route wherever the organisers can arrange. The three day 1300km (815 mile) event reflects the society of the period with the drivers and passengers having fun by dressing up in appropriate clothing for the pre-war period! - Veteran in two classes: Up to 1905 and 1906 to 1919. As with the original schedule the event is made up of three legs, with our first stop Angouleme (instead of Bordeaux in the original rally). Here we were met with locally produced fortified wine and some delicate pastry’s organised by Club Charentals de Belles Voitures. 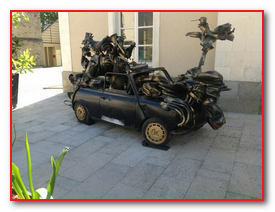 We left Angouleme on the second day heading south via Saint Emilion (a lovely wine region!) and the Pyrenees Mountains to our overnight stop at Pamplona, famous for its bull run - not just yet though! In Pamploma we were greeted by local classic car enthusiasts, lots of kindred spirits and reveling in the fun of the day. We did well again today and in the top three. After arriving we all enjoyed a marvelous cocktail party and local celebrations. The third leg takes roads that are much more fun, less traveled across to Navarra and Rioja - it's a wine fest every time we do this run. There was a regularity set on gravel on this last day, which was very hard to do on time. We did well but the chasing Italian driven Aston did slightly better. But any chance of them winning went out the window when they threw it all away with a wrong test which dropped them right down the field. Sad for them but good for us! 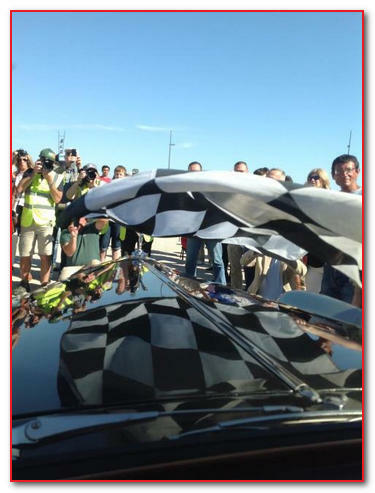 A really good day today and we were feeling really confident when we arrived in Madrid to take the chequered flag. And with a major effort and finishing in style the winner is... Us! Great feeling to going across the finishing line in first place. The evening was rounded off with a a gala dinner and prize giving. I drove the car to the Gala Prize giving at the Madrid Ritz where it was on display for the evening looking both grand and resplendent with it's winners rosette across the bonnet. Catriona Rings my faithful navigator on many events gave a nice speech. At the end of the evening the Alfa stayed at the Ritz... I was in no shape to drive the car back after the dinner and celebrations! Oh, and I nearly forgot, we met up with Michael Portillo celebrating his 60th birthday. So a good evening was had by all! There’s more photos on my facebook page. For those of you that don’t already follow, might be an idea to more photos on my facebook page like my page now as there are more rallies coming, you can also see instant comments on my twitter channel so you can follow me there as well. 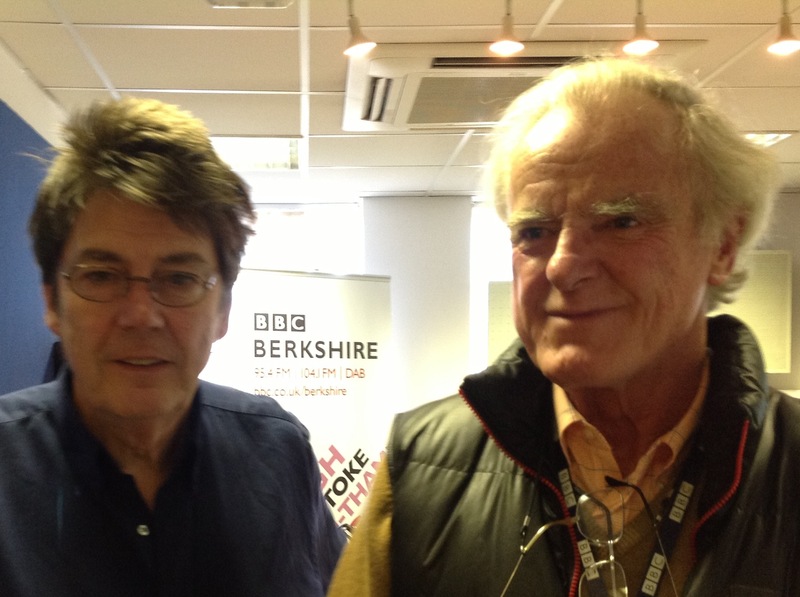 I had a great time yesterday when I visited BBC Radio Berkshire and chatted with the DJ Mike Read on his feature 'A Few of my Favourite Things'. You can listen to the interview on BBC iPlayer (the interview starts about 2 hours and 6 minutes in, straight after The Electric Light Orchestra's Livin' Thing). Mike obviously knows his stuff when it comes to music but he also has a keen interest in cars which came out as we discussed my F1 career, McLaren and James Hunt - who Mike had met several times in James' heyday and we recalled his 'lively approach'! » my favourite book - Catch 22, a great book - the last line made me laugh for weeks - read it to find out why! Mike also quizzed me about the release of Rush in September this year. Can't wait to see the final film and watch Chris Hemsworth playing James Hunt and of course Stephen Mangan who is playing me in the film. But as I talk about what I've done and achieved it's still great to know that I was the first person to see the importance of self storage in the UK when I started Space Station Self Storage all those years ago. Now with storage locations along the M4 corridor it still fills me with pride when I look at the success we've had. Listen to the full BBC interview with Mike Read here. The interview starts about 2 hours and 6 minutes in, straight after The Electric Light Orchestra's Livin' Thing. 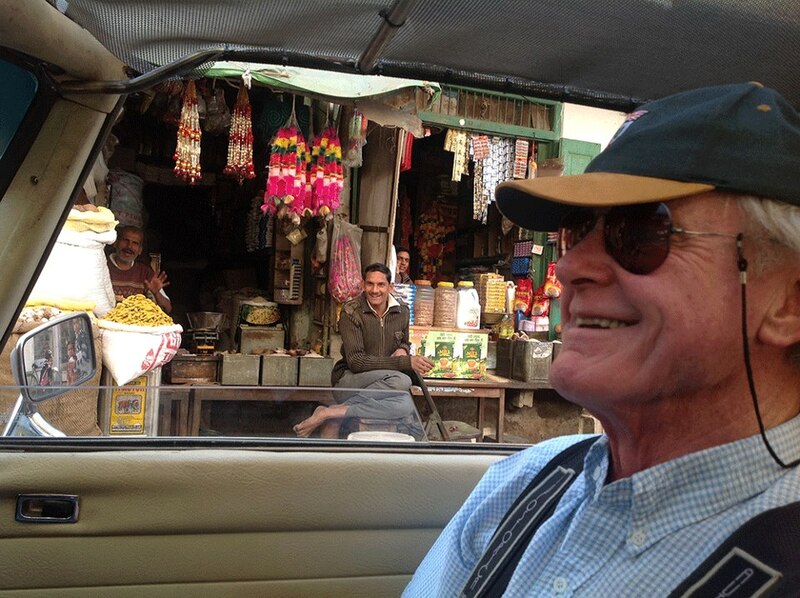 I had a great time in India on the ROARR Classic India 2013 rally. My faithful red Mercedes 280SL kept going (most of the time!) and experienced some great scenery. The driving was wonderful, exciting and entertaining (you'll need to watch the videos to fully understand what I mean). And I met some very entertaining and really interesting people - a great time. A big thank you to everyone that followed my Twitter and Facebook posts, it wasn't always possible to get a good internet connection but I managed to upload lots of photos and a few videos. Check them out on my facebook channel. There were so many experiences it's hard to rate them, but I'm currently sorting through all my pictures and videos so watch this space and my facebook channel to see more. You can enter the photo competition on the Space Station Facebook channel - just Like the page and upload your images. Good luck!